A look at offenses of college football. After reviewing the Alabama and Missouri games I compiled some diagrams of Auburn's most popular plays. They are broken down by play type, and it shows you the type of "window dressing" used to disguise the base Auburn plays. When breaking down the Auburn offense there's a few things to note before discussing the actual X's and O's. 1. Auburn's offensive line is dominant and does a few things extremely well. 2. Nick Marshall is an exceptional athlete at QB. 3. Tre Mason may be the best running back in the country. These three things play a huge role in Auburn's success this year and it is only because of these factors that Malzahn's offense is as efficient and effective as it is. I will be highlighting some of the things that make the Auburn offense go, along with reviewing the use of the uptempo offense and zone read and the use of two H-Backs in the game at the end of the post. 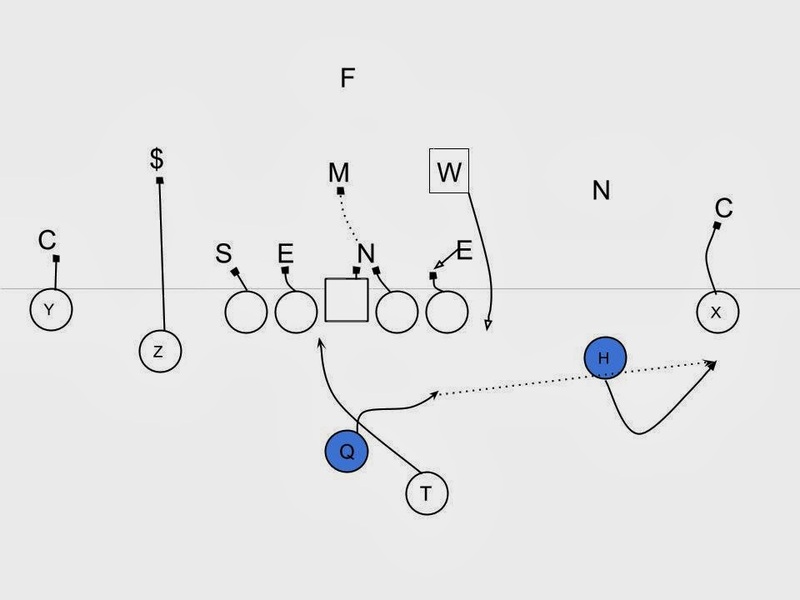 After reviewing some of their games the Auburn offense can be broken down into a few basic plays. 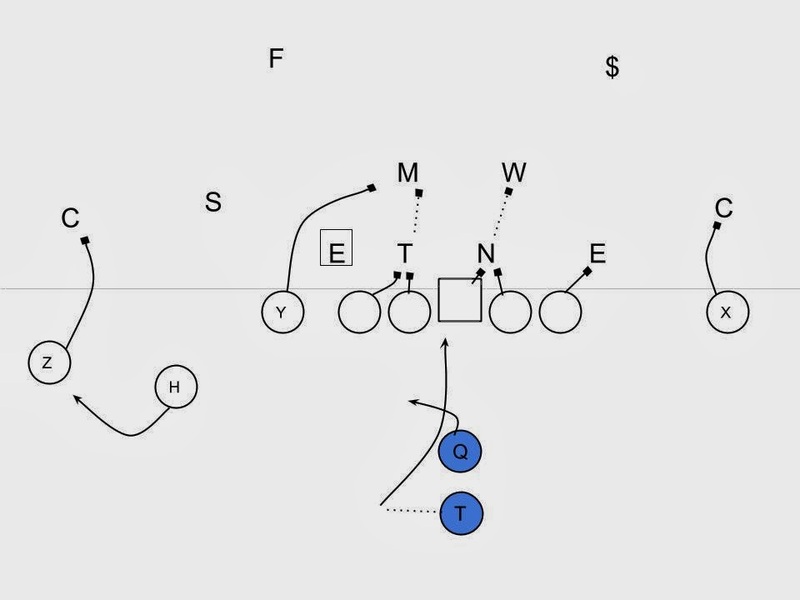 These plays are run from a multitude of personnel packages, formations, and motions in order to give the appearance of being more multiple than it really is. This also plays a huge role in allowing Auburn's offensive line to master only a certain few schemes and perfect them. 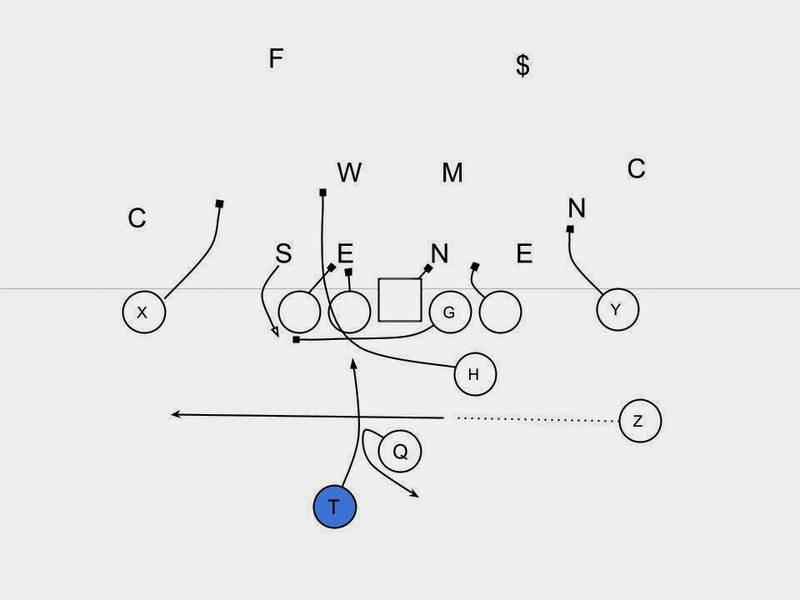 This list is even a little expansive because the inverted veer scheme and the off tackle gap schemes are essentially the same blocking techniques for the offensive line with some slight variations. 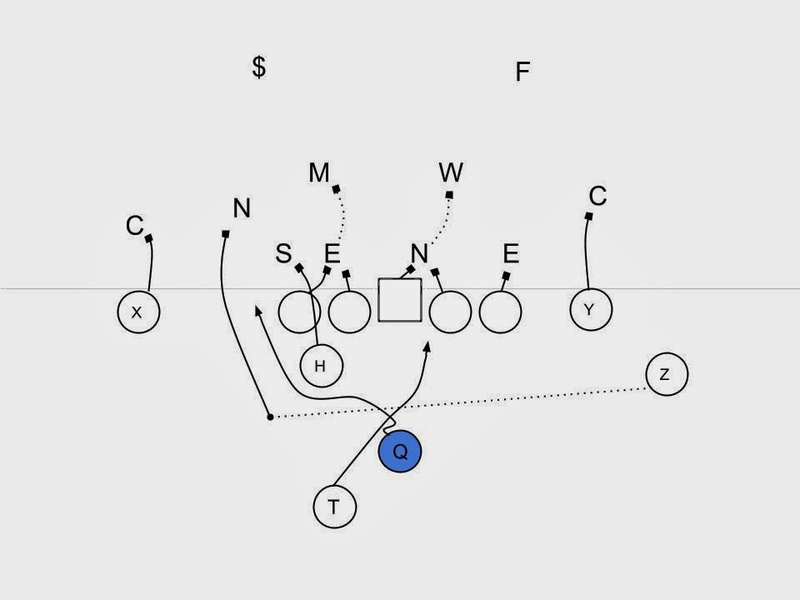 Malzahn is an expert in taking these base schemes and adding "window dressing" to disguise the simplicity and make the offense appear more multiple than it really is. The ways in which he does this are as follows. Formations are one of the least expensive ways for Malzahn and other offensive coordinators to make an offense appear to be more multiple. 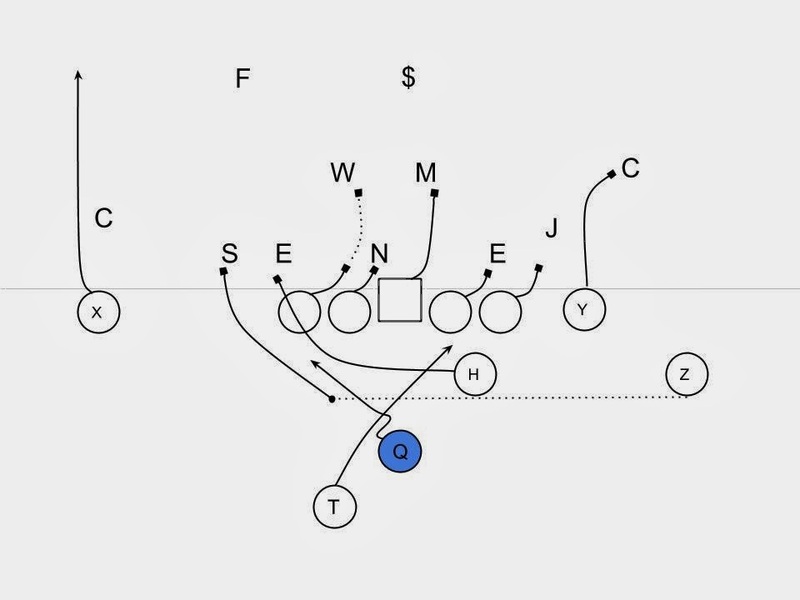 Auburn's base alignment utilizes two receivers to one side, and one to the other with an H-Back and tailback in the backfield. 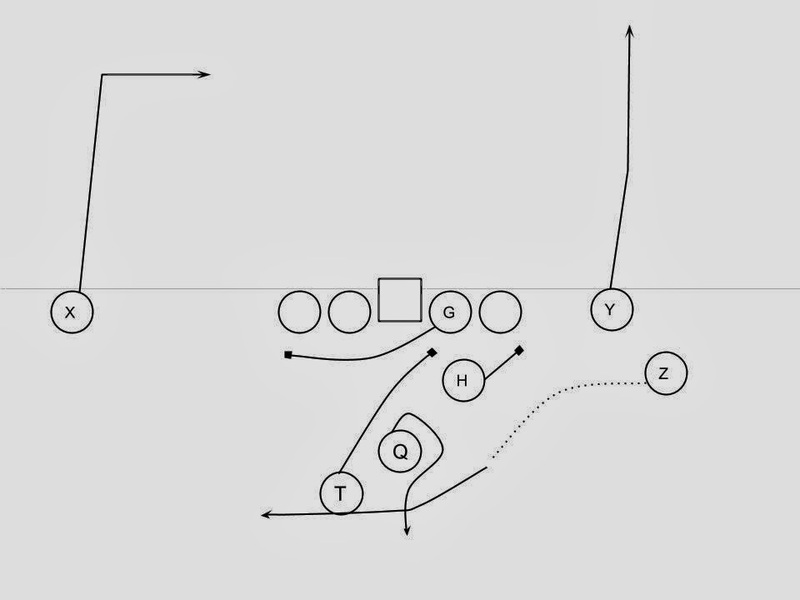 This formation is altered in numerous ways depending on the play, and it appears that players must understand where to align based on the play call. Receivers on the line of scrimmage will align tight to the formation, or split extremely wide depending on the call. Essentially all of Auburn's formations are simply variations of this. Sometimes the X and Y will align to the same side giving an unbalanced look. Other times the H-Back will be substituted for another receiver or running back and moved out of the backfield. 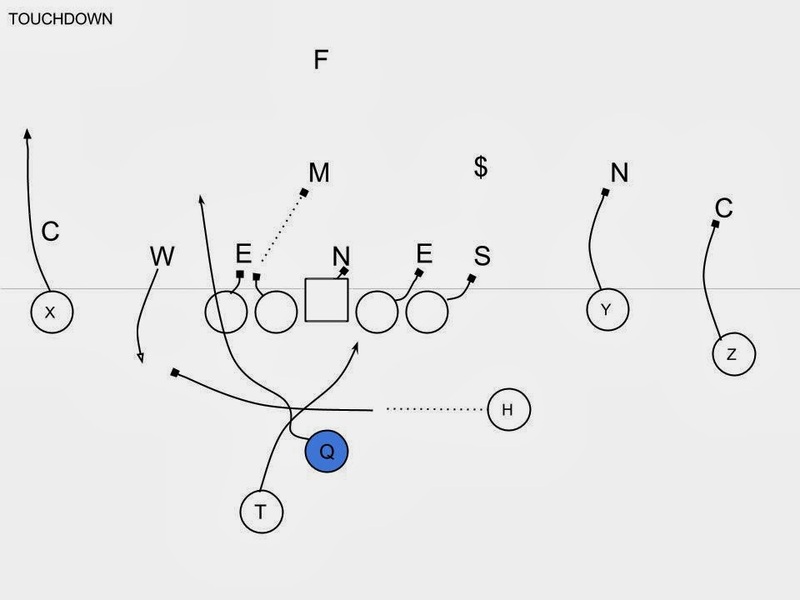 Other time the Z will be placed into the backfield as a second H-Back (discussed at the end of this post). 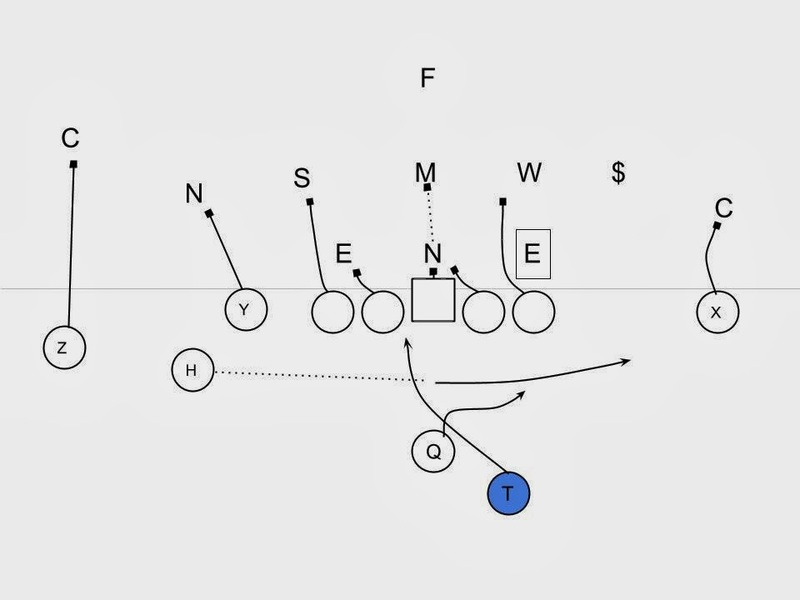 The use of running backs and receivers to run and fake jet sweep is a simple add. It appears that there are two distinct uses of the jet sweep. 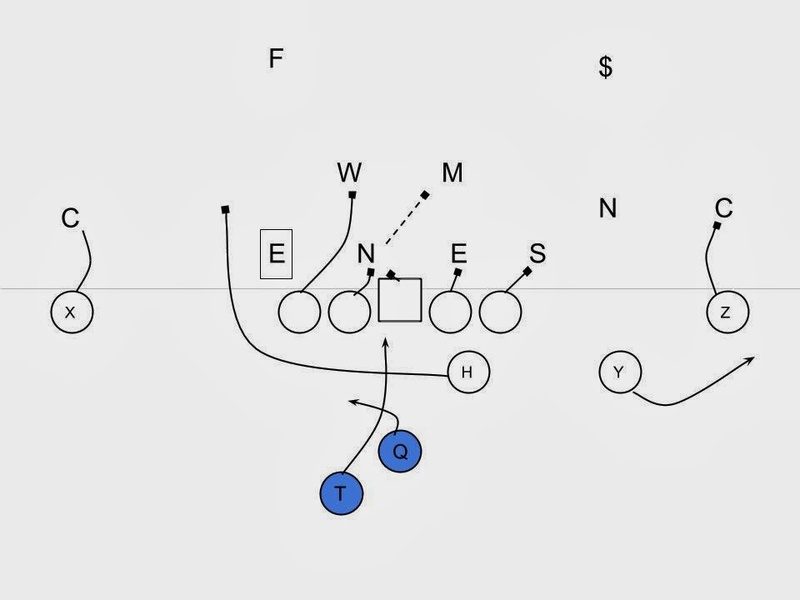 When a running back is split wide and comes in motion it is most likely the inverted veer or "Flash" play in which the QB has the option of giving to the running back on the sweep or keeping it himself. 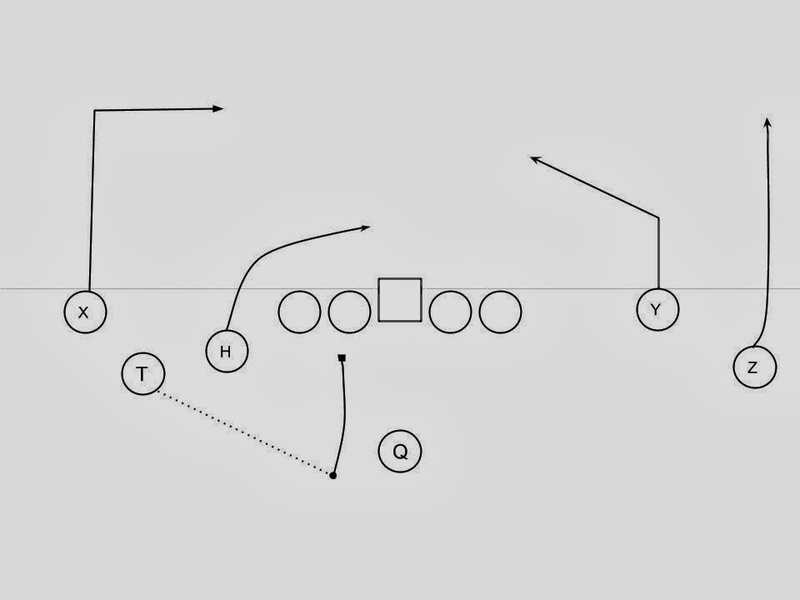 The other use is more often when a receiver runs the jet sweep and utilized mostly as a decoy for the zone read play. In this case the receiver will provide a fake and end up blocking a defender for the QB if he should keep the ball (shown below). 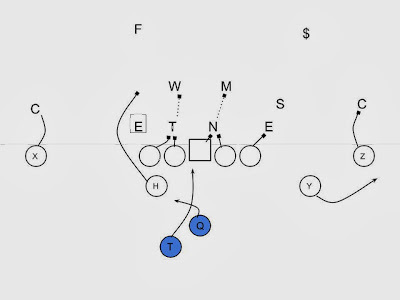 Jump motion is utilized by aligning the tailback directly behind the QB and having him motion moments before the snap to one side or the other. 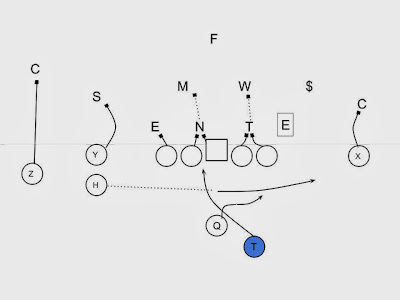 This is most often designed to give the defense as little time to prepare as many defenses key the side to the tailback in order to run specific stunts to throw off the QB read on the zone read play. The final type of motion utilized is a more standard type of motion in which a player moves from one spot in the formation to another. 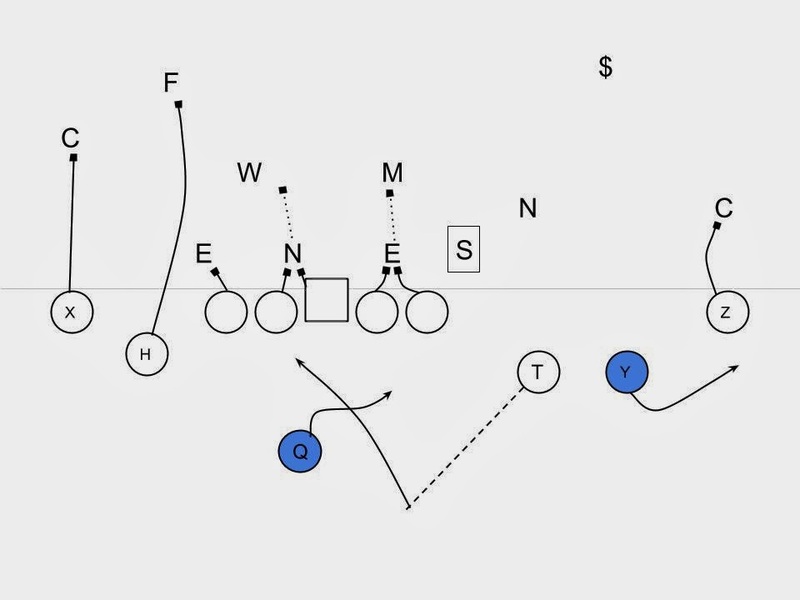 Two of the most commonly used by Auburn is motioning the tailback from an empty alignment into the backfield, and motioning a wide receiver or H-Back across the formation, usually to outflank defenders at the point of attack. 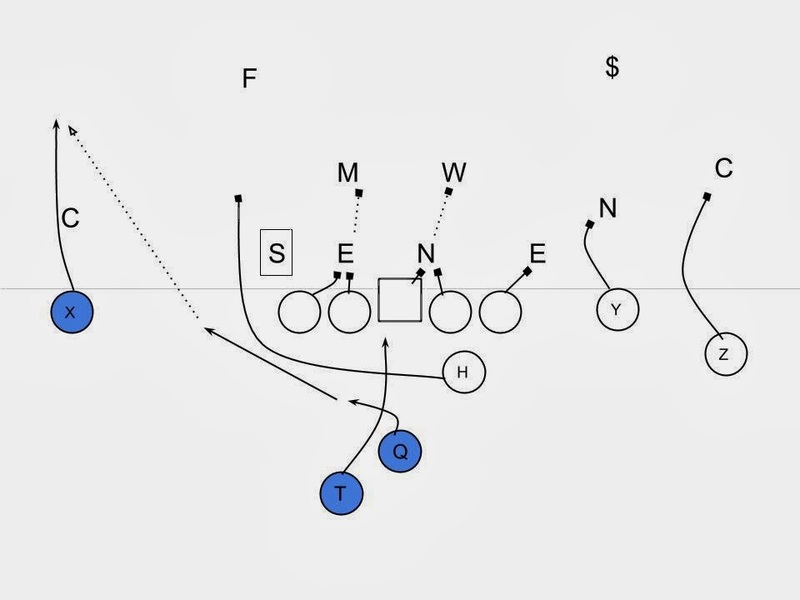 One of Auburn's main outside run plays is the Buck Sweep, often Malzahn will package a motion by a receiver to deep in the backfield to fake a reverse to help freeze defenders and help set up blocks. This is also used in the play action passing game as well as shown below (note the simplistic nature of the play action pass). Malzahn also uses a quick huddle often throughout games. Just as the uptempo nature of his offense is designed to take advantage of defenses, the quick huddle is as well. When utilizing the quick huddle the offense will align close to the line of scrimmage in a circle. Usually, the quarterback Nick Marshall will release receivers from the huddle to align, and then quickly break the huddle with the rest of the offense, aligning in seconds and snapping the football. Once again this is designed to confuse the defense, catch them off guard, and also disguise formations. 1. Give to the running back. 3. 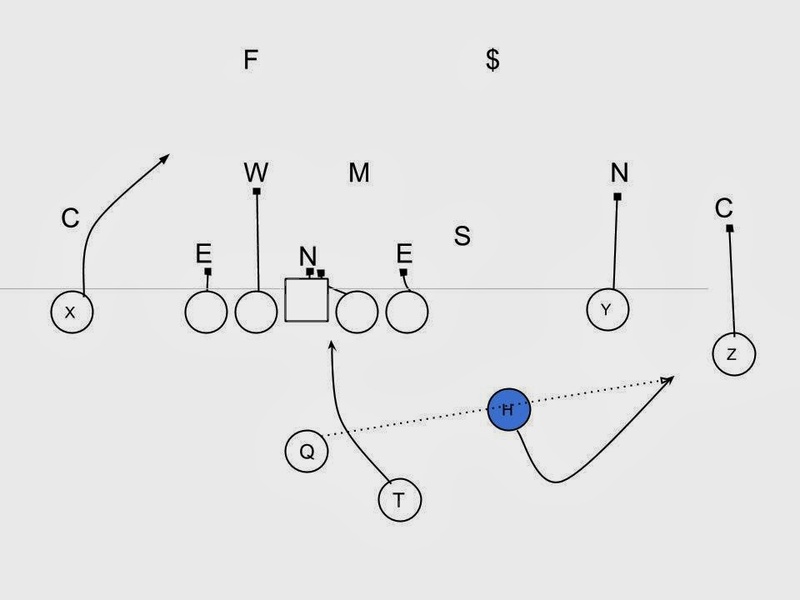 Bubble pass to the slot receiver. 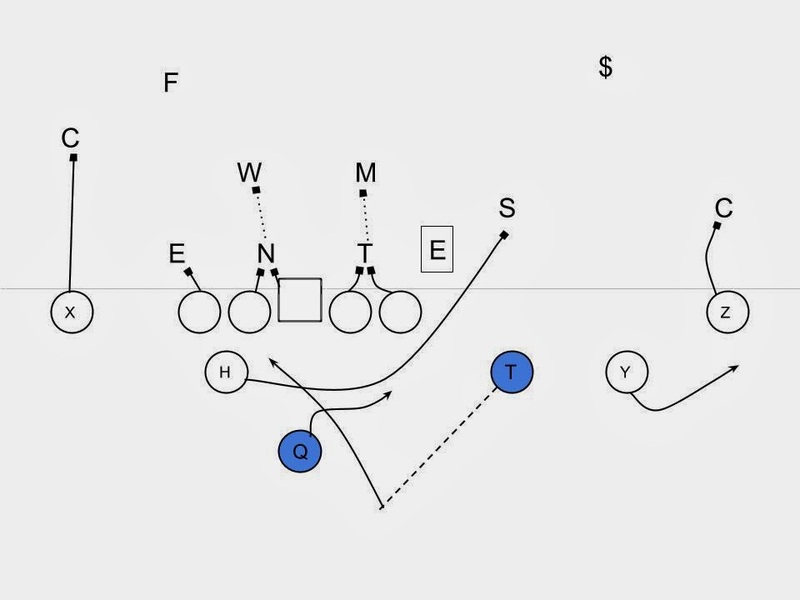 When Malzahn decides to use his uptempo offense he will often rapid fir the same play over and over, sometimes switching formations while doing so, and sometimes running from the same set for two to four plays in a row. 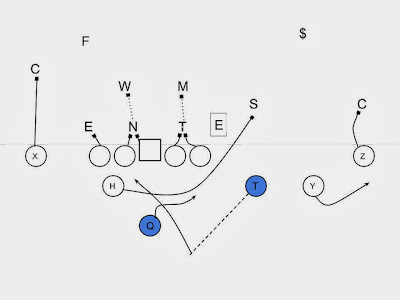 During the second half of the Iron Bowl he did just this, utilizing the spread set shown above and the inside zone read play to stretch the Alabama defense horizontally. The zone read is the perfect uptempo play for Auburn, and is definitely enhanced by the skill of their offensive line, Tre Mason at running back, and Nick Marshall at quarterback. Below is the video of the uptempo five play drive. Note that the only reason Auburn comes out of this uptempo is because they are forced to because of an injury to an Alabama player. 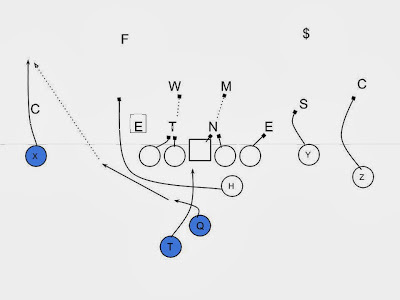 In total Auburn ran the zone read five times, giving the ball to Mason three of the times and throwing the bubble to slot on the other two plays. 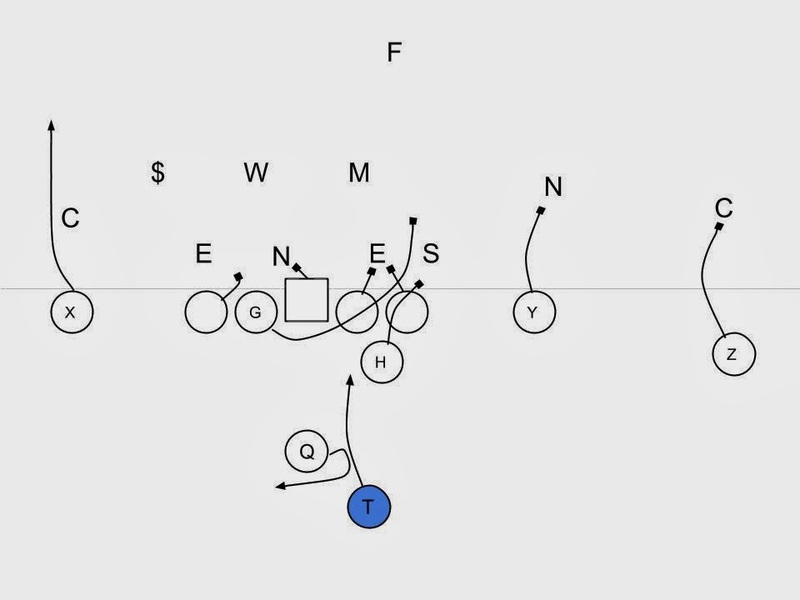 Overall, the zone read and its use of double teams can be demoralizing for interior defensive linemen, while the bubble by the slot places alley players in a bind with coming into the box to stop the run and also limit the damage done by a completion on the bubble. 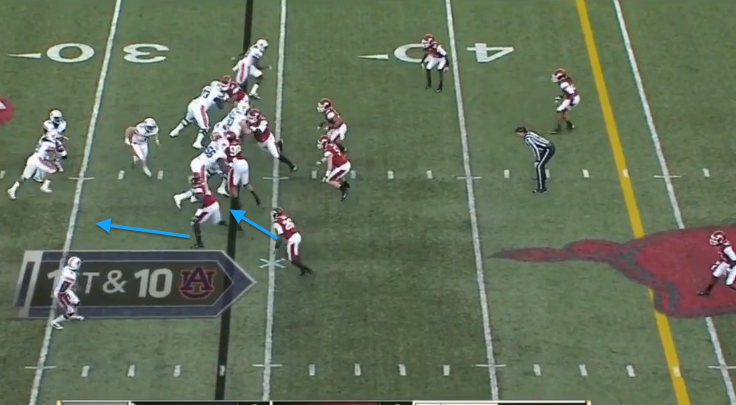 Another package that Malzahn has utilized this season is two H-Backs at the same time. Below are two examples of the way in which two H-Backs (H and Z) are used. 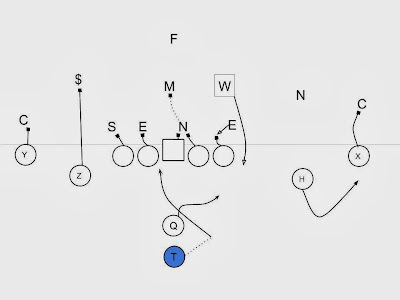 The first is a zone read play in which the tailback motions into the backfield before the play (this is a great example of Malzahn using motion to add window dressing to his most used play). 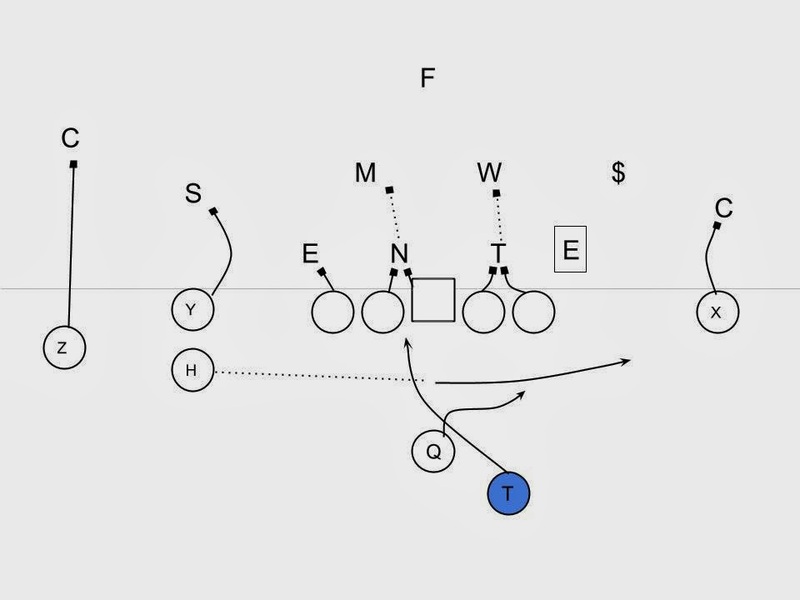 The two H-Backs are used to arc away from the zone and provide lead blocking for quarterback Nick Marshall if he keeps the ball on the zone read. It appears that Marshall has been encouraged to keep the ball when they utilize the double lead, most likely because he is so skilled and the mismatch created by at least one of the H-Backs blocking a defensive back. 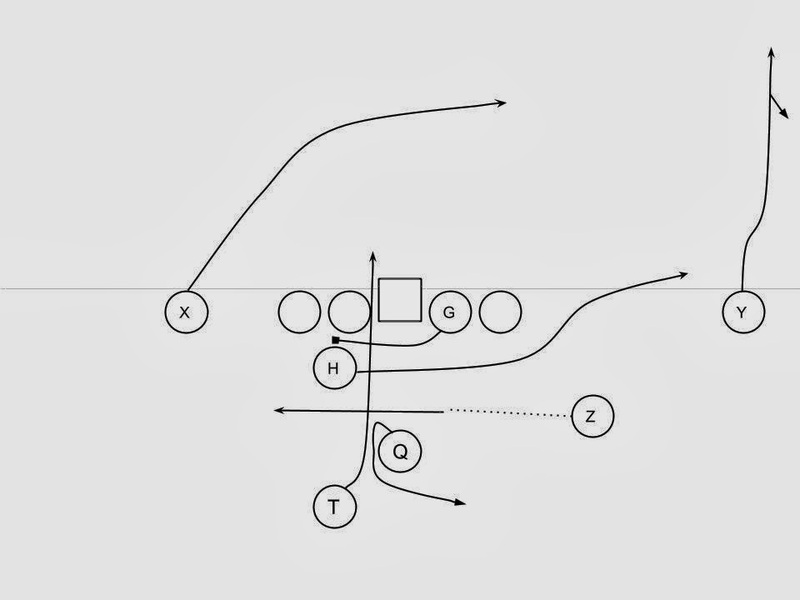 The second play is an example of the inverted veer with the sweep portion being a jet sweep (this is often referred to as "Flash", with the same play with a set running back being "Dash"). 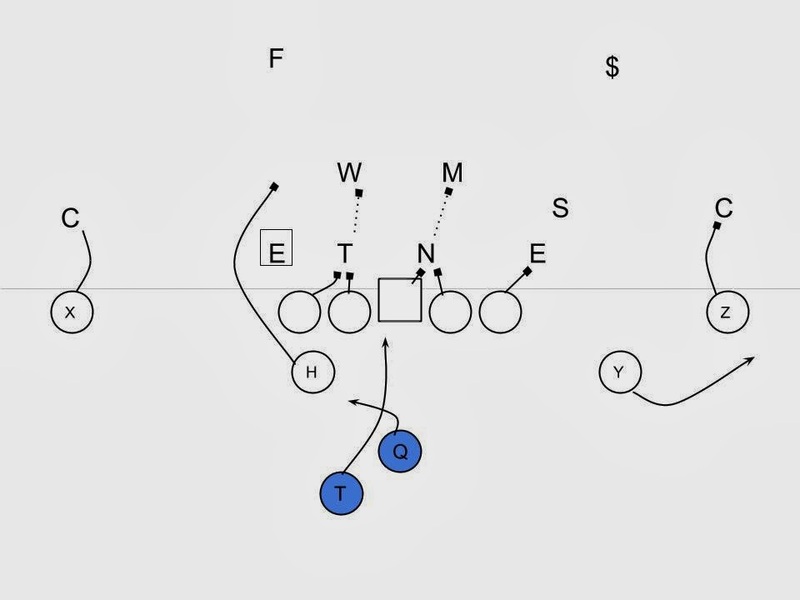 On the play the H and Z are once again used as lead blockers to the outside, however, instead of it being for the QB it is now for the tailback who is running the sweep. As with many of Auburn's plays this is a read play and the QB does have the option to keep the ball inside and follow the pulling guard. The two H-Back formation provides Malzahn with two elite blockers, often setting them up to block smaller defenders on many plays. 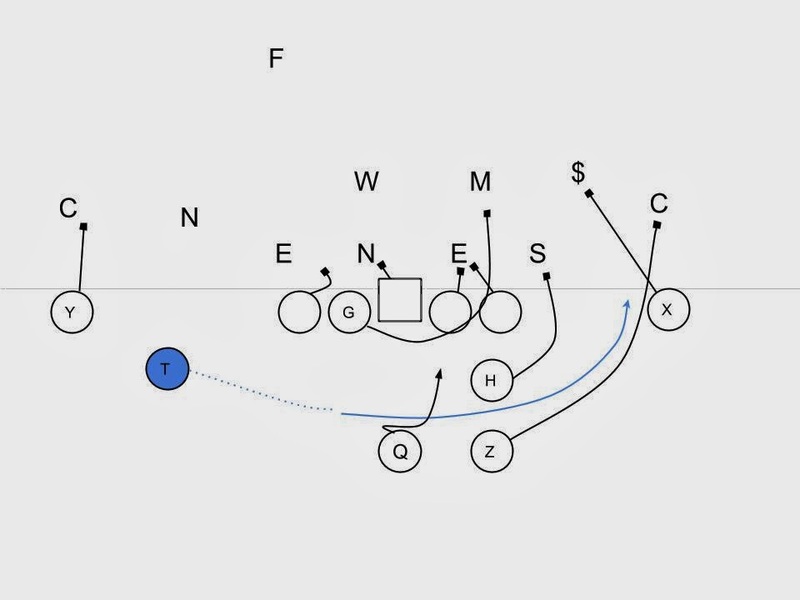 The use of this package is also another example of the way in which Malzahn dresses up his base plays using different formations and motion, while changing nothing for the guys up front. The inside zone read has become a staple of college and high school teams across the country. Combining powerful double teams at the line of scrimmage, with a read on one (or more) defender(s) allows for a very versatile, and downhill running play. 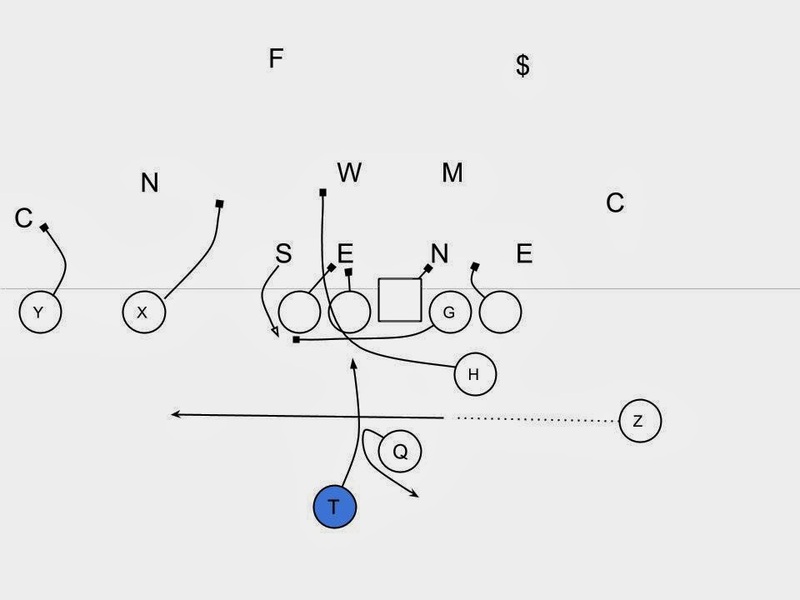 The inside zone read has also been coupled with a second read creating a triple option type play, which allows the QB to pitch or throw a quick screen, further stretching the field horizontally. This play has been well documented across the internet. Gus Malzahn's running game forces defenses to defend the entire field while playing assignment football. 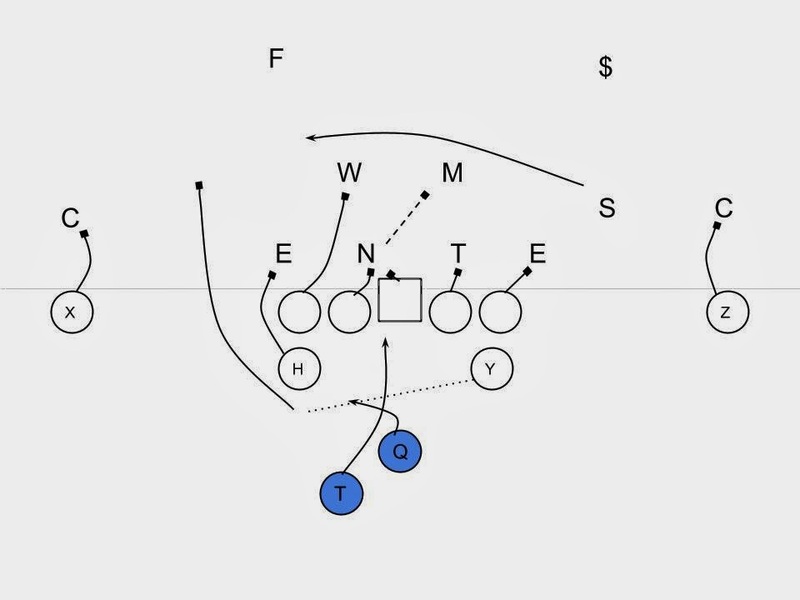 The use of multiple formations and motions help disguise his very basic running game and he makes heavy use of ball fakes by the QB, running backs and wide receivers. All of this combined presents a complicated display for defenses (and fans) while allowing Auburn to consistently run the same play over and over with only slight tweaks. 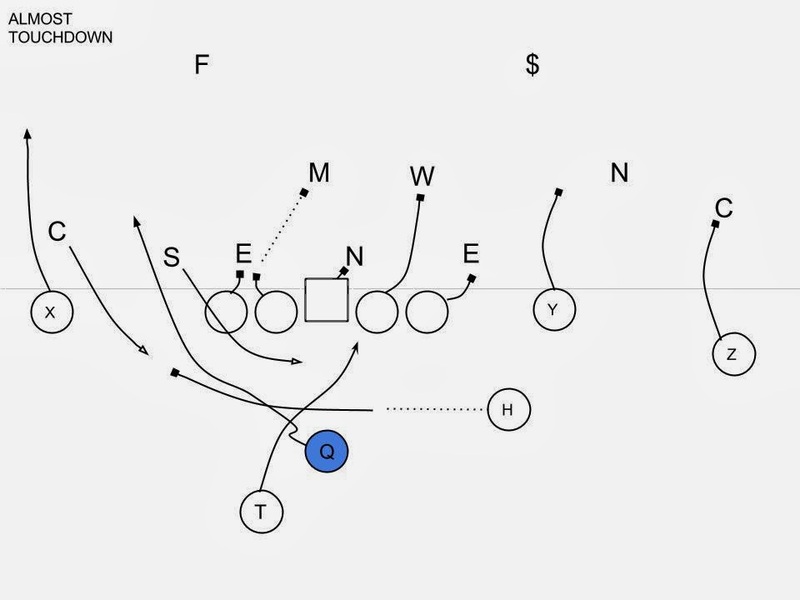 Auburn operates out of a lot of two and three back sets, with at least one of those backs usually being an H-back (a fullback/tight end type player located just behind the line of scrimmage). Below we see a diagram of a basic zone read play utilizing a two back set. 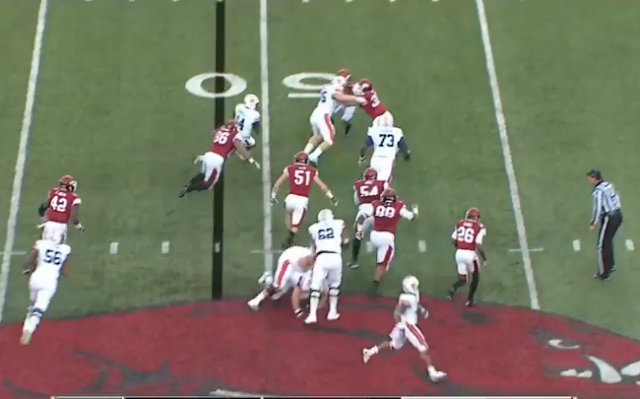 Highlighted in blue are the quarterback and tailback as they mesh, while the QB reads the unblocked defensive end (inside the square). Also note the H who is arcing past and around the read (DE) and up field to block the force defender. Malzahn has long been incorporating the H-back into his offense for multiple purposes. In the zone running game he is mostly utilized to block the force defender to the read side, this help sets up the QB for when he keeps the ball on the read by giving him a blocker at the point of attack. 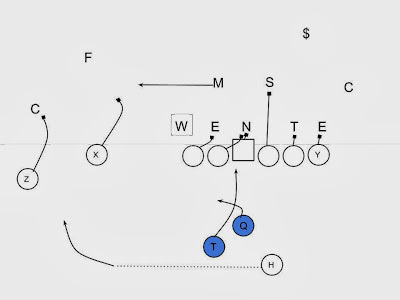 Here we see Auburn aligned in 3x1 set with an H-back in the backfield, they will motion the inside man into the backfield deep as a tail back. 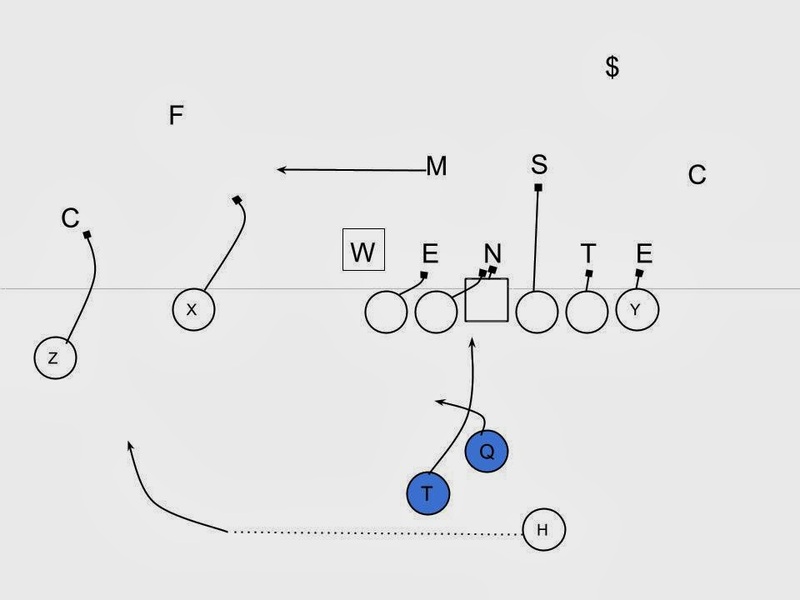 We now see the final formation which is a popular Auburn 2x1 set and also the read for the inside zone identified. Also notice stacked just outside the read is another defender. The defenses front line alignment will allow for two double teams by offensive lineman, and the left tackle blocking the defensive end on his own. 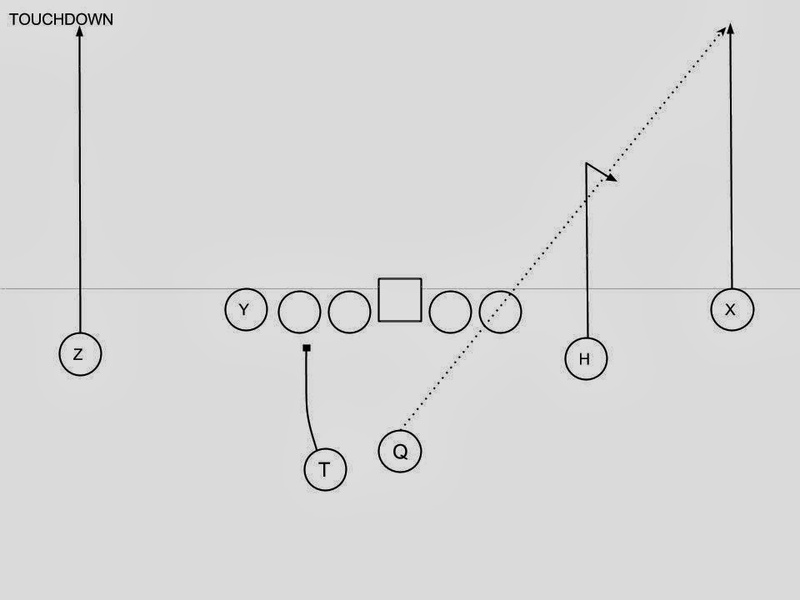 Here's a diagram showing the designed blocking scheme. 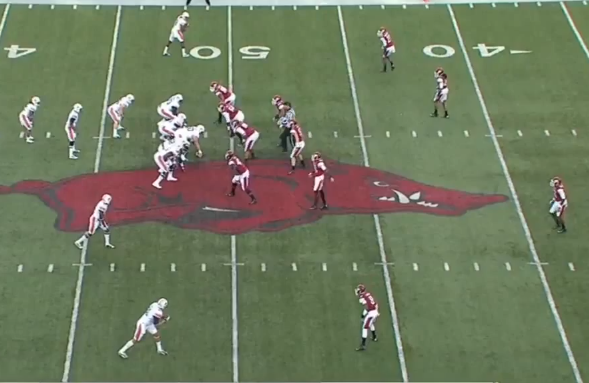 Also note the tight split of the split end to the left side, this is something Malzahn uses a lot in the running game. Here we see those double teams develop as the QB and TB mesh. 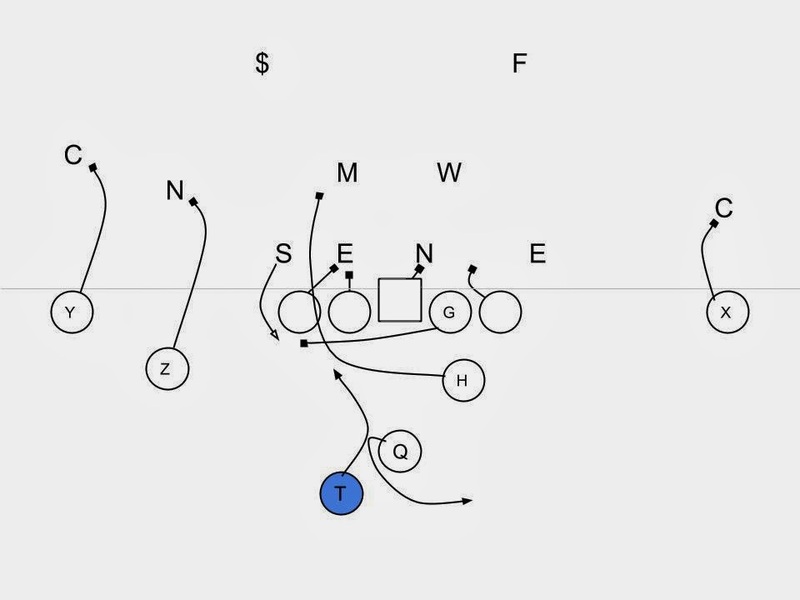 Along with that we notice that both the read key and outside defender both keying the mesh and pushing up field. 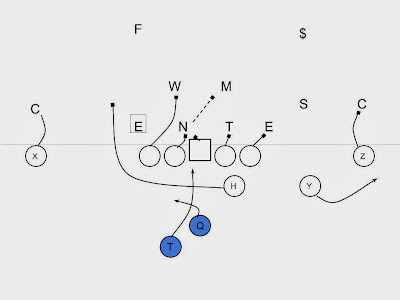 The H-back begins to cross the formation and will be responsible for blocking the next defender outside of the read in case the QB is given a pull read (which will not be the case). The QB makes the correct read and gives it to the TB. We now see the linebackers sucked into the line and the double teams being executed well. Also notice the two unblocked defenders (the read key #42 and outside defender #26) who are in no shape to make a tackle. The tail back will push through the LOS for a great game. 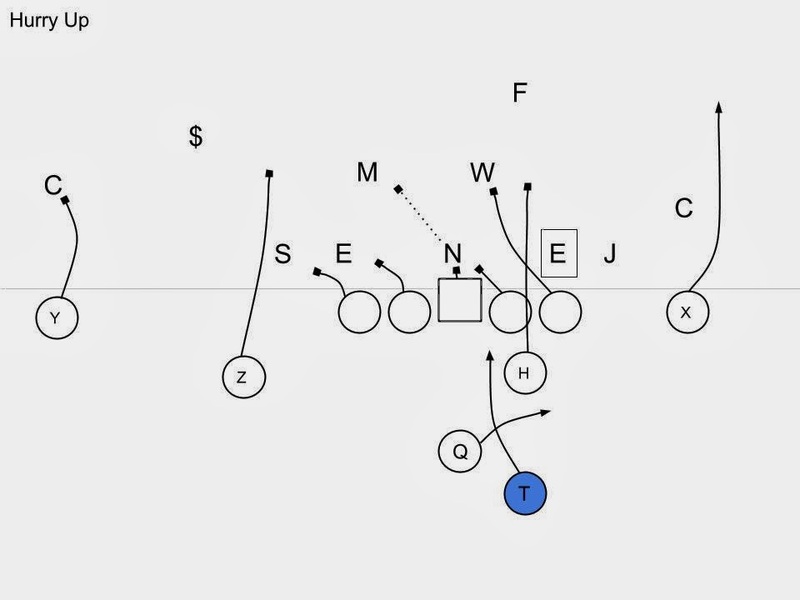 The inside zone read play is not new to college football, but what this will highlight is that Auburn's execution (on double teams, reads, and running lanes) and their ability to go quickly, places defenses in conflict. The next play they would execute a similar play on second and short. One thing to note is that between the running back being tackle on first down and the snap on second down was 13 total seconds...both actual and on the game clock. Malzahn does not always execute at a break neck speed, but it is a possibility and he utilizes it well. 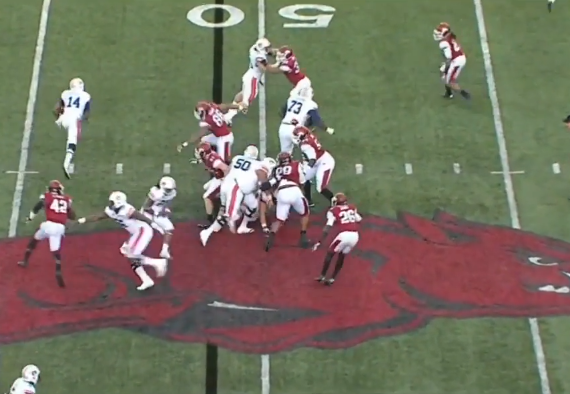 Malzahn made heavy use of the inside zone early on against Arkansas, essentially pushing Arkansas to completely shut it down in all phases. 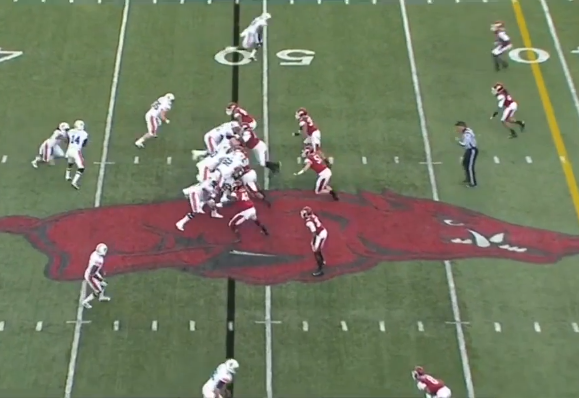 Naturally the next phase of the inside zone was for Arkansas to place a greater emphasis on stopping the running back, which would then free up the QB to keep. Here we see Auburn in a 2x1 set with the H-back set to the running backs side. The H-back has become an important part of the Malzahn offense, providing blocking and receiving threats across the field. 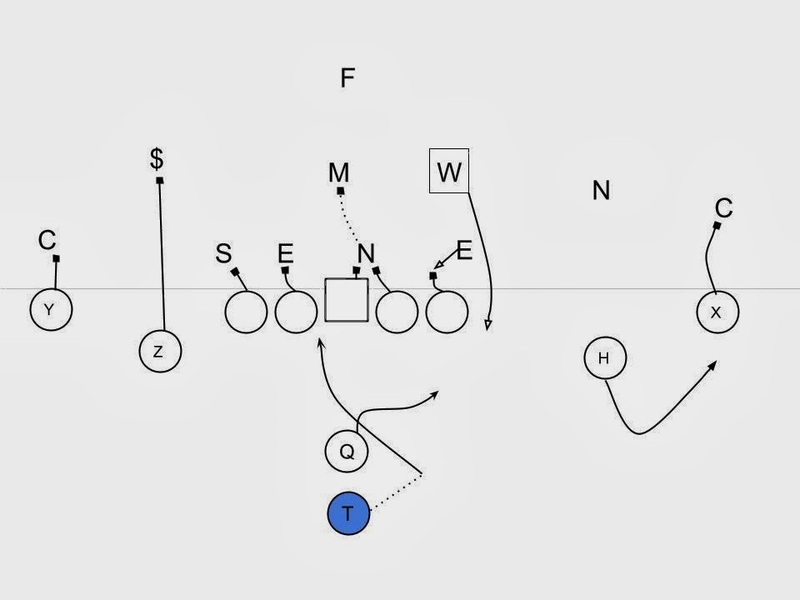 On the snap the QB and running back mesh and the H-back will arc block to the second level. Nick Marshall, the Auburn quarterback, keeps on the read and the H-back engages a second level defender. Below is a diagram of the play. Note the will linebacker (W) becomes the force defender as he flows outside, but is engaged by the H-back. 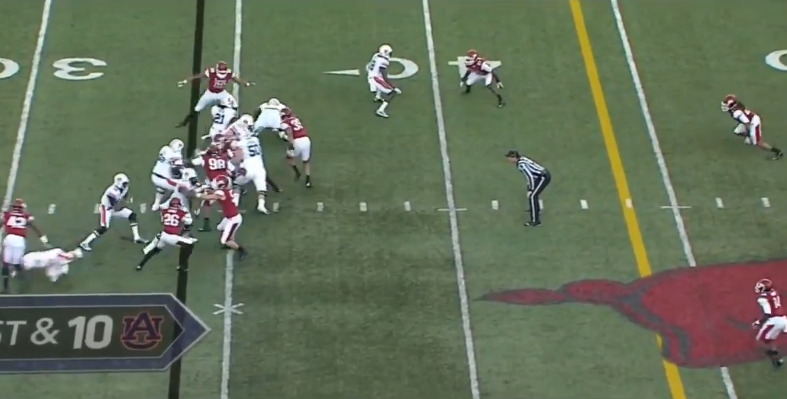 Also note the H-back this time aligned to the side he blocks, rather than crossing the formation. 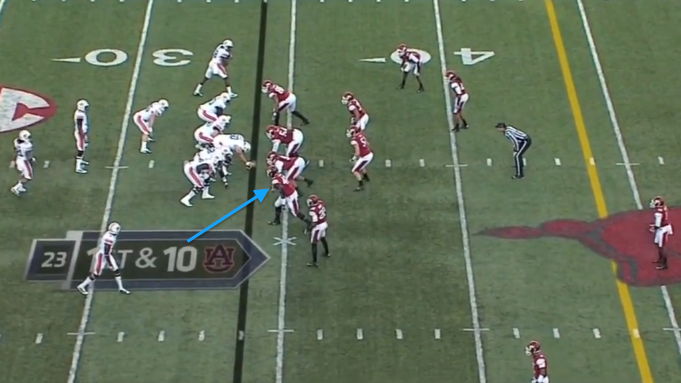 Playing games with the H-back and his alignment is crucial for Malzahn as teams heavily key his alignment. The Iron Bowl was no different, with Auburn storming its way back on a late 4th quarter drive mostly running inside zone variations. 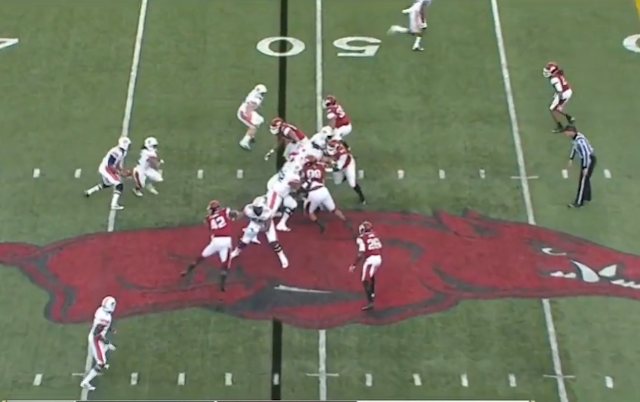 The inside zone read utilized by Malzahn (and others) often incorporates a second read for the QB, should he keep the ball initially. This allows the QB the ability to pitch or throw some type of quick screen or route to a wide receiver or slot and stretches defenses to their horizontal limits. 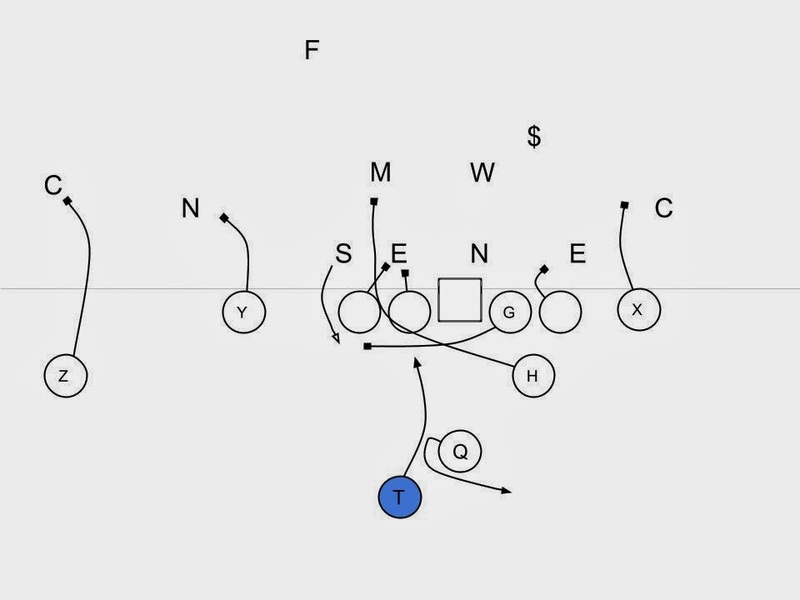 This is often compared to the triple option as popularized by the wishbone, split back veer, and flexbone offenses, however with a modern twist to it. Below we see a diagram of the zone read incorporating that second phase. While the pitch or throw is not heavily utilized the threat of it forces defenses (especially alley and outside defenders) to honor that threat at all times. 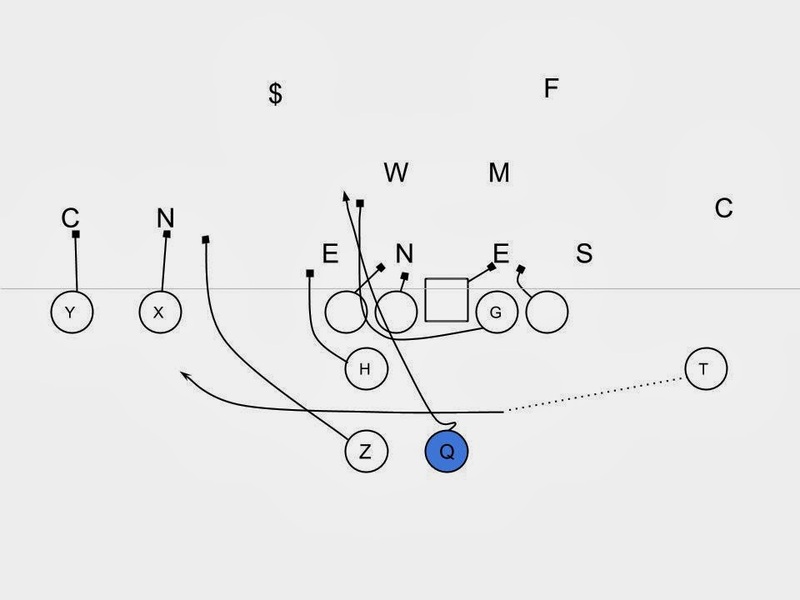 In this case the Auburn inside linebacker (M) follows the motion by the H-back out of the box. 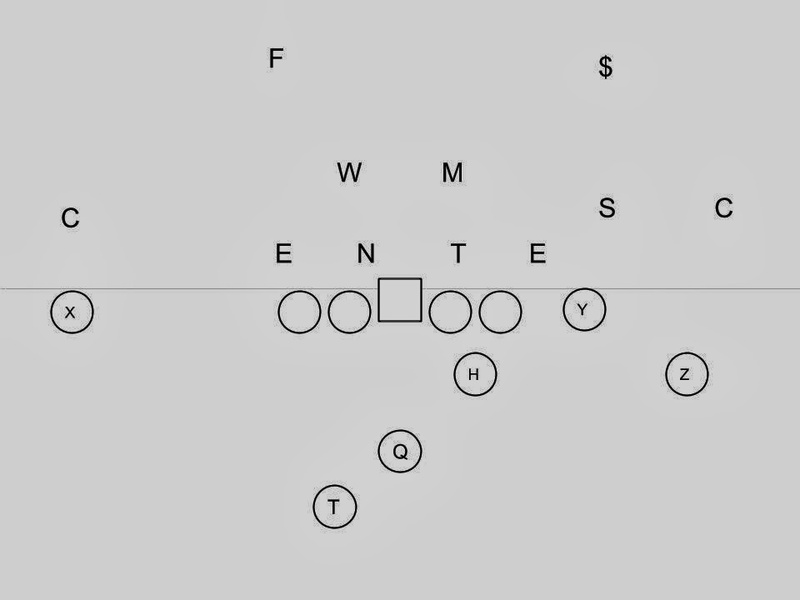 This works particularly well because of the down and distance (3rd and 2) and the lightening of the box that is created by the exit of linebacker. The touchdown score would come a few plays later (all of which were zone read variations) in which QB Nick Marshall would pull the football and find that second option. In this case it was Auburn WR Sammie Coates who released down the field. 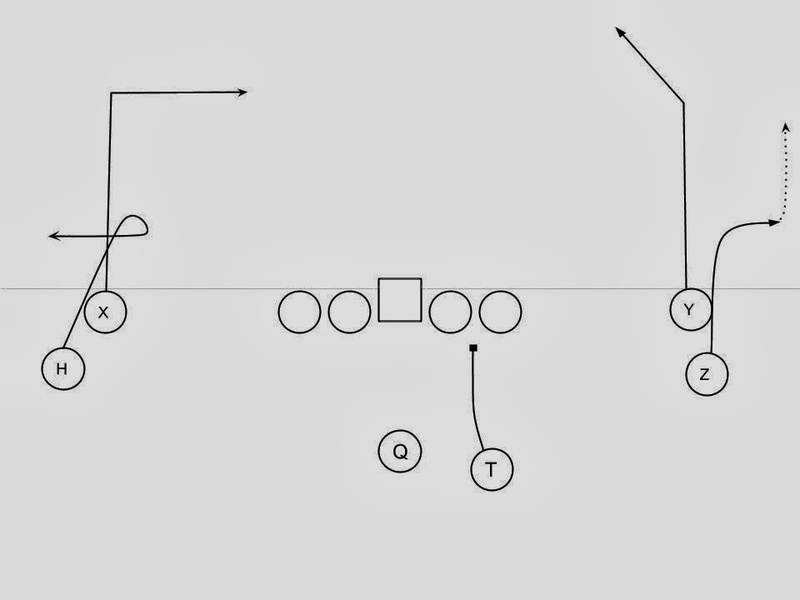 Here is the diagram of the play. Note that it is similar to most of the other zone reads, with an H-back arcing to block the force. However, as Marshall (QB) is being tracked down he is able to find Coates who has slipped by the defensive backs who are now coming up to tackle Marshall. And here is the video of the play. 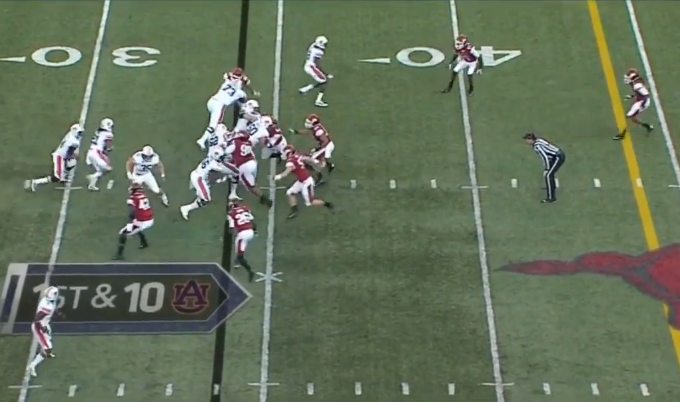 Auburn almost exclusively ran zone read for its final drive. Slowly tearing chunks out of the Alabama defense. 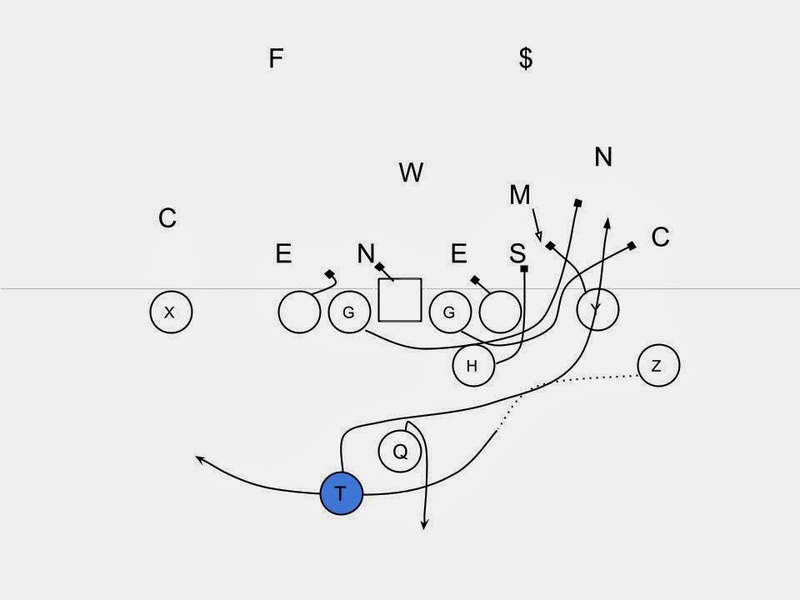 However, it was the least utilized part of the read (as some would call it the third option of the triple option) that finally broke the Alabama defense. Malzahn and others like him have worked to create havoc on defenses by forcing them to defend the entire width of the field, multiple running threats, and playing assignment football at all times. 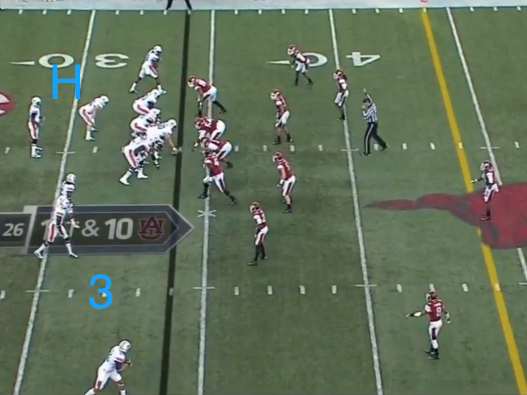 Here are some of the other variations of the zone read that Auburn ran in the Iron Bowl. Auburn has utilized a lot of two H-Back sets this year, during the Iron Bowl they began motioning them both to one side a lot, helping set up Marshall for keeps. It's also hard to tell what Marshall is reading, or if these are called keeps. 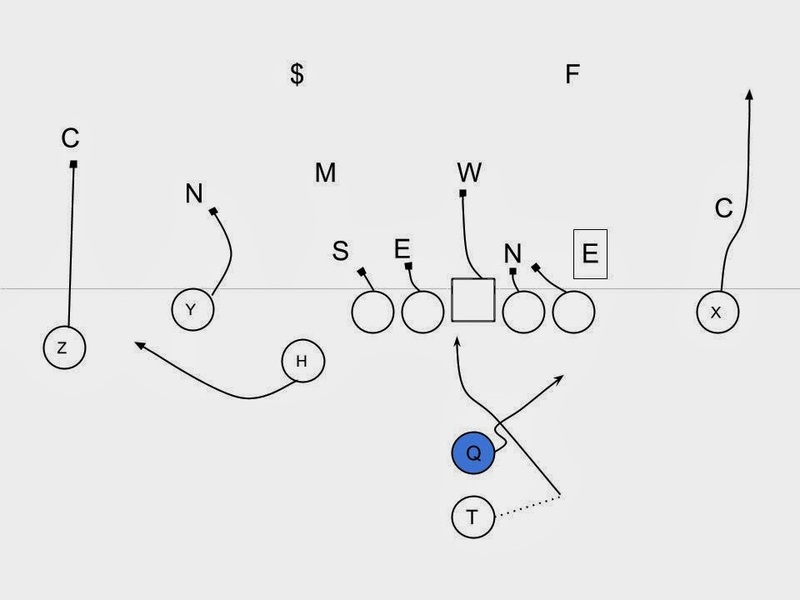 I plan on doing a post looking at the two H-back formation and its use by Auburn. An adjustment by many teams is to shift the running back over late as to not give away the direction of the zone play until right before the snap.